Storms often wash debris onto the beach along the Atlantic Coast. Occasionally, a shipwreck will be uncovered and swept into the surf line. In November of 1994, Hurricane Gordon deposited the bow section of a large wooden vessel onto the shore at Virginia Beach. 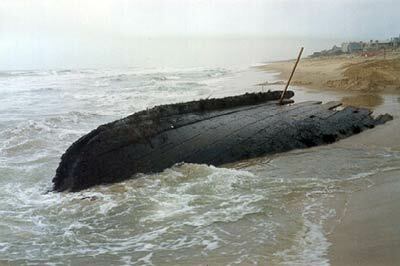 As is often the case in situations like this, Fielding Tyler, the Director of the nearby Life Saving Museum of Virginia, was called to investigate, and he immediately began making plans to move the wreck to a safer location. Soon afterwards, a couple of MAHS members were visiting the Museum and heard about the discovery. On returning home to D.C., they began organizing a group of volunteers from MAHS to travel to Virginia Beach and help document the wreck.